Candlemas is a festival on February 2nd which celebrates an early episode in the life of Jesus and combines both the Jewish customs of the presentation of the first-born son in the Temple and the purification of Mary in obedience to the Torah (Leviticus 12, Exodus 13:12–15). It is described in the Gospel of Luke. 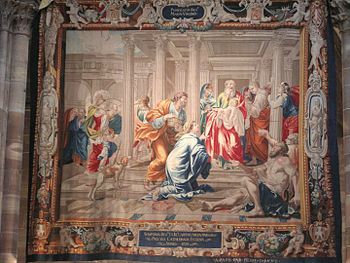 Luke explicitly says that Joseph and Mary take the option provided for poor people (those who could not afford a lamb; Leviticus 12:8), sacrificing "a pair of turtledoves, or two young pigeons." Leviticus 12:1–4. “LORD, now lettest Thou Thy servant depart in peace; according to Thy word: for mine eyes have seen Thy salvation, which Thou hast prepared before the face of all people: to be a light to lighten the gentiles and to be the glory of Thy people Israel “ (Luke 2:29–32). Simeon then prophesied to Mary: "Behold, this child is set for the falling and the rising of many in Israel, and for a sign which is spoken against. Yes, a sword will pierce through your own soul, that the thoughts of many hearts may be revealed" (Luke 2:34–35). There are several ideas about why this day is called Candlemas. The basic idea is that Jesus brought light into the world and as candles were the main source of light in people’s homes and the churches the day became known as Candlemas. It was also a day when the priest would bless candles, usually beeswax candles, in a special service in the church. Later processions were held with people carrying candles. An even later tradition is that every home should show a lighted candle in the window on the eve of Candlemas. The rhyme seems to mean that if it is nice on Candlemas you can expect six more weeks of bad winter weather, if it isn't nice on Candlemas Day, the weather should get better. Wherewith ye dress'd the Christmas Hall." In France Candlemas is called the feast of Chandeleur and traditionally pancakes are eaten. One tradition is that the pancakes, with their round shape and golden colour reminiscent of the solar disc, refer to the return of Spring after the dark and cold of Winter. There is a certain symbolism associated with the preparation of the crêpes. A tradition dating back to the late fifth century and linked to a fertility rite is to flip the crepes in the air with the right hand while holding a coin in the left hand, in order to have prosperity throughout the year. One has to ensure that the pancake lands properly back in the pan. 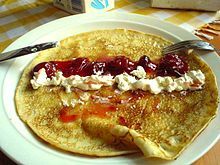 It is also said that the first crepe made should be kept in an armoire to ensure a plentiful harvest later in the year. It is sometimes specified that it be placed at the top of the armoire, and the pancake will supposedly not get mouldy and will keep misery and deprivation far away. In the United States, February 2nd is known as Groundhog Day, perhaps because on this day groundhogs would come out of winter hibernation and stay out if the winter was over.